Two-year-old team defeats number-one College of Staten Island for chance to play in Division III tournament. Coach Patrick Horne and Brooklyn College President Karen L. Gould with the new CUNYAC champions. Far right, Athletics Director Bruce Filosa. 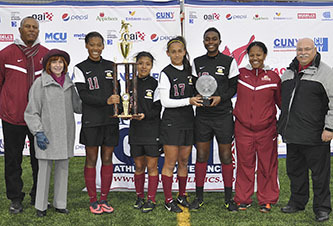 In only their second year as an athletic program, the Brooklyn College women's soccer team capped off a historic run, defeating the top-seeded College of Staten Island (CSI) by a score of 3-1 to capture its first City University of the New York Athletic Conference (CUNYAC) Championship and earn a berth in the upcoming NCAA Division III tournament. "Today's performance shows how far we've come as a team over this season," said Brooklyn College Head Coach Patrick Horne. "We worked hard each game and practice and today was a culmination of our hard work, as we beat a team that defeated us twice during the season to win the CUNYAC Championship." Preparations for this weekend's success started in 2012, when in conjunction with the opening of the new Brooklyn College soccer field and track, President Karen L. Gould and Director of Athletics Bruce Filosa collaborated to create the women's soccer program. After conducting a national search for a head coach, Brooklyn College hired Horne, an experienced leader with solid experience with both men and women on the junior college of Division III and Division II ranks. While the team's first season saw some challenges, it managed a respectable record during 2012. In 2013, with the new recruits and a crop of returning players, the team finished second heading into the CUNYAC Tournament and entered the CUNYAC Final with a 14-3 record. While two of the Bulldog's losses came to CSI earlier this year, this weekend the Bulldogs would not be denied in front of their home crowd, scoring their first goal in the first half, and two in the second. There were many contributors to Saturday's victory, beginning with Bergelie Louis, who got Brooklyn on the board in the game's thirteenth minute, breaking through the CSI defense and touching the ball past the Dolphin goalkeeper Victoria Donegan. Staten Island answered six minutes later, as Samantha Wysokowski headed a corner kick from Melissa Gelardi, which hit the crossbar and dropped in front of Demi-Jean Martorano, who tied the game. While each team had opportunities, both defenses would hold tight for the remainder of the first half. In the second half, Sayla Flores set up Jordan Kerwin, who scored on a beautiful left footed kick to give Brooklyn College their second lead of the game at 2-1. With CSI pressing to try to even the game, Flores was able to find a streaking Shani Abrahams, who sent a shot past Donegan, to increase the Bulldogs advantage to 3-1 and seal the victory. Defender Jasmine Fermin, a freshman who has anchored the Bulldog defense all season, earned praise from all as well as she was a big reason why the ever-dangerous Dolphin offense was limited to one goal. Flores, who notched two crucial assists, would be named the game's most valuable player. "Playing with your head and never giving up will take you to the top," said Flores. "That is what we all did today and what we will continue to do as a team." "Our team is always looking forward to the next challenge," said Coach Horne. "The first one was to make the CUNYAC Tournament; then we aimed to win the championship. Now our challenge is to try to become the first women's team in conference history to win an NCAA Tournament game and advance to the second round." Junior defender Janet Rodriguez, one of the original members of the team, praised her teammates, saying, "Today's win is due to teamwork. This win is a dream come true to compete against top schools in the tournament. I'm confident my team will play exactly the same as we did today, with heart and like Bulldogs!"